Note: Actian Corporation discontinued these items on July 1, 2015. We will be able to sell them only while in-stock quantities last, on a first-come, first-served basis. 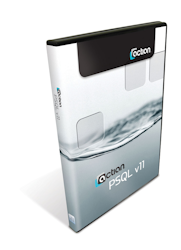 The Actian PSQL v11 Workgroup Engine is designed for smaller networks (up to 5 concurrent users) and single-user installations. The engine license can be installed to ONE server or workstation at a time, and should be licensed based on the number of concurrent computers that will be sharing access to the data on that system. All other workstations in the network get the free PSQL Client installed and need not be licensed. The Workgroup Engine license is available in three user counts, 1, 3, and 5. Separate 1-User User Count Increase licenses are also available and may be added to an existing engine to increase its total user count (to a maximum of 5). If you expect to need more than 5 users in the near future, please look at the Server Engine instead, which starts at 6 users and can go up from there. Pervasive has no direct upgrade path from the Workgroup Engine to the Server Engine (though you can use the Workgroup Engine on a standalone laptop or backup server). You can get more details about this product from our product page. Not sure which license you need? Try our new Product Selector now! Please note that this license is for a standalone machine ONLY. If you need to add users to an existing PSQL v11 Workgroup, you will need a User Count Increase instead. Please note that this license is for adding users to an existing PSQL v11 Workgroup Engine ONLY. If you need to to license a standalone machine, you will need a Base license (above) instead. DO NOT purchase a 1-User User Count Increase if you actually need a base license -- we will be unable to refund your money, and you will be unable to use it! The PSQL v11 Deployment license is a special license that grants you access to the PSQL Deployment Portal. From here, you can build your own PSQL Workgroup Licenses(in standard quantities of 1, 3, and 5, or UCI's of 1 or 2), until you use up your purchased seat count. The portal can be "recharged" by simply buying another Deployment Pack. This pack contains 25 seats.